← Featured on Blog Better Boston: All things New! Okay so I almost never post about jewelry BUT it is a new year and that means a new wardrobe. Plus being a merchandiser for the super chic Chloe and Isabel dictates that I must post at least once 😉 With 40% off Chloe + Isabel favorites, there has never been a better time to shop. Plus I want to fill you in on what C+I is all about! 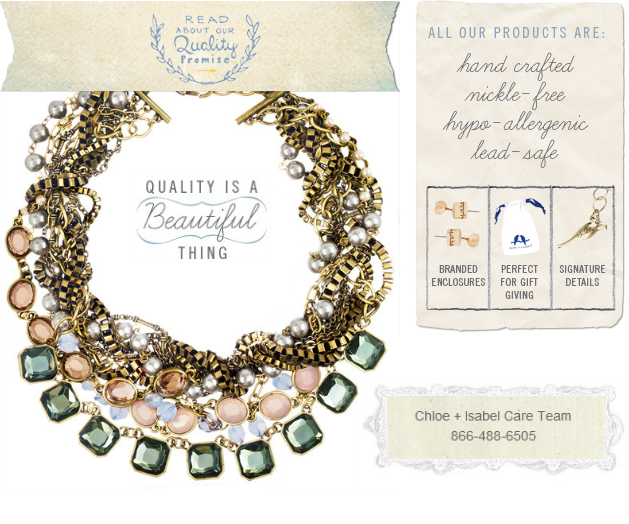 Chloe + Isabel designs high-end chic, wearable jewelry with every woman in mind. “Chloe” represents the daring trend-seeker in us, while “Isabel” embodies timeless, refined style. Collections feature hand-sculpted metals, semi-precious stones, vintage-inspired castings and Swarovski crystal accents. What more could you ask for? Oh- yeah everything comes with a LIFETIME WARRANTY. Featured in popular print and online publications, such as Lucky, Vogue, In-Style, Glamour, and Us Weekly, Chloe + Isabel jewelry has been widely recognized by the fashion community. Everything is designed, and sourced locally by their in-house New York design team, which has over 35 years of experience from the top fashion houses. Additionally, the jewelry is produced at the world’s best known fashion jewelry manufacturer, who also creates fashion jewelry for brands like Neiman Marcus, Barney’s and Bergdorf Goodman. Interested in hosting a pop-up? Plus an exclusive piece of jewelry when your pop-up sales reach $400! In addition, we will hold a raffle during your Chloe + Isabel party and one of your lucky guests will win $25 off their first purchase of $75 or more! So, How do I become a Hostess? Serve refreshments or a tasty treat! Share your custom Chloe and Isabel Pop-up Shop Online link to collect orders from people who cannot attend before the event. Have a great time trying on jewelry and socializing!